Note: Registration does not apply to Mastercam employees, Resellers, or Demo Resellers. These users already have accounts. Please contact [email protected] for more information regarding these user types. The registration and linking process ensures that only Mastercam customers receive the benefits of Mastercam.com’s value-added content such as the Mastercam Forums and Knowledgebase. To register and link, please use the steps below. 1. Launch your web browser and navigate to mastercam.com or click this link: www.mastercam.com. 2. Click on the Register link in the upper-right corner of the Mastercam landing page. 3. When the Create your account page is displayed, enter the required information and then click the Create Account button on the bottom of the page. 4. You should now see a message that your account was created successfully and an email will have been sent to you with validation instructions. The email sent address will be [email protected], so if you do not see the email in your inbox please check your spam and junk folders. 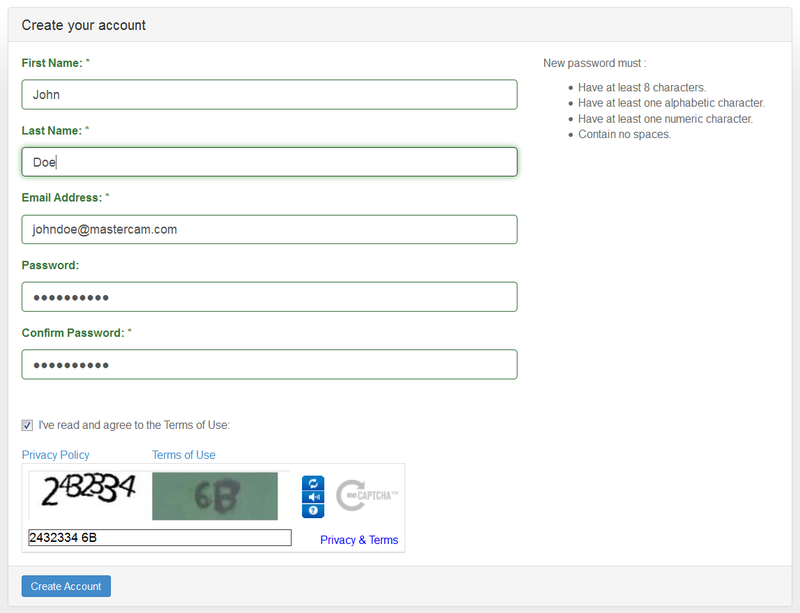 This activation email will also include your login name that was generated automatically. 5. To validate your account, follow the instructions in the email you received. 6. Once your account is validated, log in using your new ID and the password you created during registration. You will be prompted to link your account with your Mastercam SIM. To link your account properly you must download and run the linking program to a computer that has Mastercam installed and running. If you have Mastercam, simply download the linking code generator and copy it into your main Mastercam folder (C:\program files\mcam(version) on most systems) and then run the linker from there. If you have Mastercam X6 or earlier you will also need to download and install CodeMeter. CodeMeter is already installed with Mastercam X7 and up. The linking program and the CodeMeter downloads can be found here: https://www.mastercam.com/en-us/Support-Downloads-Drivers-and-Applets. Once you have generated a linking code, copy the Linking code into the Account Link Code: edit field and click the link my account button. If the computer running Mastercam does not have access to the internet, save the code generated to a text file and then you can finish this process on another computer by just cutting and pasting the linking code from the saved text file into the dialogue shown below. Problem: User receives error message “The program can’t start because WIBUCM32.dll is missing from your computer. Try reinstalling the program to fix this problem.” when running MastercamDotComLinking.exe. Problem: User running a NetHASP cannot generate a linking code using MastercamDotComLinking.exe. Place the executable in the root directory of the Mastercam installation. Run mastercamDotComLinking.exe from this location. The linking code should be generated successfully.